My “vision” while napping on the couch. The shaded black at the bottom is the side of the pickup. Here’s a weird one: Oddly, I’ve been dreaming about RVing lately. Today I took one of those afternoon naps on the couch – a thing I am often fond of doing these days. 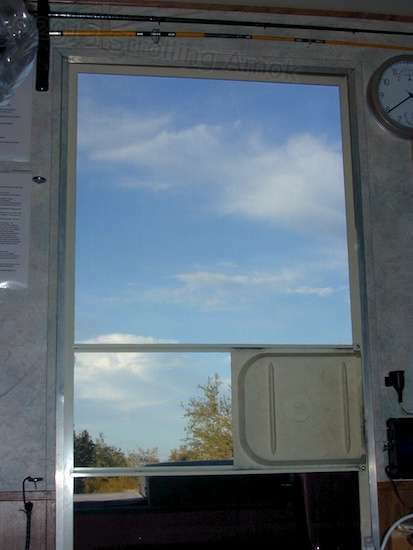 I was having a rather confusing dream about RVing – driving around near “home” in a place that looked like Colorado, and of falling into an inescapable sleep while my RV motorhome was moving, yet being unable to wake up to take the wheel! Fortunately, I never crashed, and when I actually did wake up after a few rounds of this, I found myself groggily gazing out the screen door with no wild idea where I was. I was “home” – thanks to the dreams – with the Mighty Furd parked nearby. But what was “home”? I had no idea where that was, but the sky just past my feet was so beautiful that wherever I must be sure looked okay. It was so quiet and peaceful that my wondering ceased. Naturally, I eventually wakened enough to figure out that I was in the desert near Quartzsite, but it took awhile. Sure was a pretty sky just past my tootsies! It quickly put me in a peaceful and well-rested frame of mind. I am one very fortunate person! 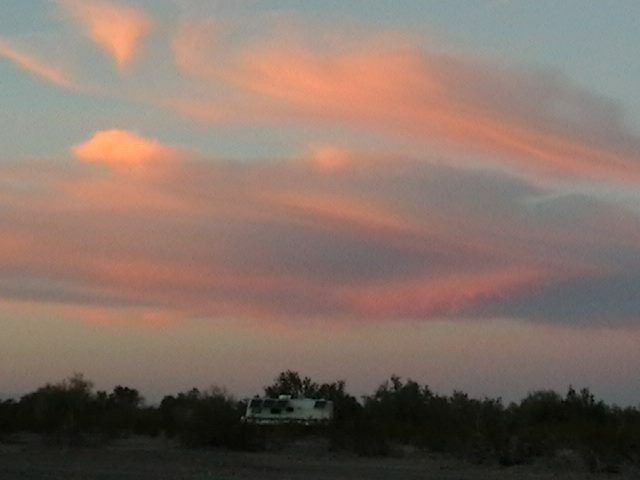 Update: And here’s one view of Arizona’s big sky and the Enterprise near sunset. Photo taken from Camp Swankie by the Swankster herself. …and I am thankful for it!